The Beijing skyline is filled with cranes. I’ve been taking pictures of my stay in Beijing – I’ve added the pictures from Laurence too. In addition I am creating some panoramic shots stitching together many pictures to make a panorama. The panorama is great for trying to give some feeling of the scale of the sights. I am here in Beijing with Laurence – a colleague from the UK. 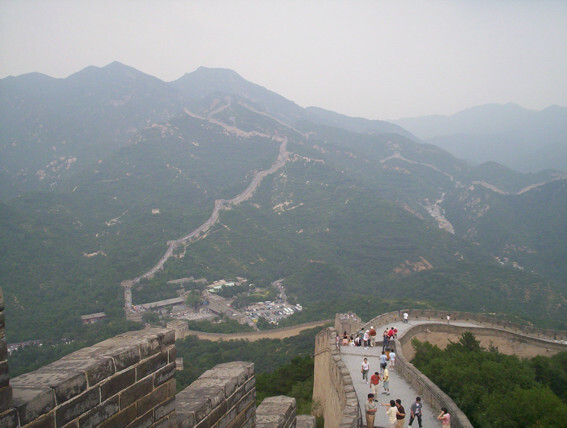 Yesterday we did the unthinkable – and booked ourselves on an organised tour to the Great Wall. First stop – the Ming Tombs – about 50km North West of Beijing itself. As you can see it was drizzling and foggy. Next stop – after lunch and shopping – was the Great Wall at Ba Da Ling itself. We drove for just a few minutes and from nowhere Tolkeinesque mountains started to loom up through the mist. Very impressive. We arrived and the snow started falling. I wanted to get a geocache – so we took the less travelled and much much steeper southern part of the wall. As you can see – almost whiteout conditions. The climb up was just slippery; going down was part farce, part winter sport. I’ll post a video of that later! Finally – back into a very very wet Beijing for the evening. We decided to avoid the local delicacies on sale in the hutong – pictures of those soon – but it was a festival – so fireworks, firecrackers – and kids with sparklers. I’m in Beijing with Laurence – a friend from work in the UK. We were taken out to lunch by the project team from Novell – to a local tofu restuarant. Tofu served in ways I’d never seen it before. Even as a dessert. This evening we took a taxi to Tiananmen Square – and walked around. It truly is immense. We were accosted by dozens of people selling kites, Mao watches, books of Mao Quotations – and people just wanting to talk and speak English. We then went wandering, found a restuarant, and using a combination of pointing and my month old mandarin skills – we ordered Peking Duck, rice and beer. I even managed to ask for a receipt and get the taxi driver back to our hotel. I’ve just arrived in Beijing after a day of travelling. I left home before dawn for a 6am flight to San Francisco, then flew to Beijing. The flight was uneventful; immigration stressfree. First impressions of Beijing? It’s raining, foggy and construction is everywhere. Tomorrow I will be in the local Novell office, more updates then.